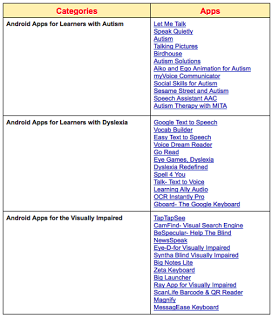 For those of you who haven't seen it yet, below is a handy chart featuring some good Android apps for students with special needs. We have arranged the apps into three main categories: Android apps for learners with autism, android apps for learners with Dyslexia, and Android apps for the visually impaired. If you have other suggestions to add to the list, please share with us in our Facebook page.